eBroselow’s web-based medication reference tool takes the math out of medicine. It provides emergency rooms, pharmacies and EMS with clinical content that eliminates math and extra steps in drug administration and acute care. This improves medication safety, reduces the cost of care, and improves clinical outcomes. The key difference between eBroselow and a traditional medication encyclopedia is eBroselow’s concept of a “Virtual page”. The virtual page displays drug mixing and administration information tailored for a specific indication and patient weight. Consequently, pharmacists and nurses see only the preparation and administration information pertinent to their needs. The numbers, such as specific mL dilution and administration volumes, are all specified - eliminating the need for manual calculations. Barcodes and QR codes on every virtual page allow quick lookup using barcode scanners and mobile devices. This enables downstream labeling and information reference. eBroselow provides healthcare practitioners with critical, size-specific therapeutic information in seconds so that they can deliver prompt, competent and confident emergency care. Read More. eBroselow Neonatal software helps pharmacists, neonatologists and neonatal nurses prepare and deliver medications to neonates. The application contains weight-based drug dosages, administration instructions, mixing instructions and references to underlying research for a long list of drugs. Read More. eBroselow SafeDose, the mobile application, puts the most comprehensive, up-to-date acute medication dosing standard right in the palm of your hand. 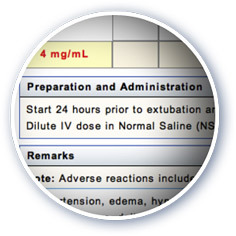 eBroselow SafeDose delivers the eBroselow system content in a streamlined, easy-to-navigate format-anywhere you need it. Read More.